If the battery is flat, it is possible to start the engine using an auxiliary battery with the same capacity or a little higher than the flat one. 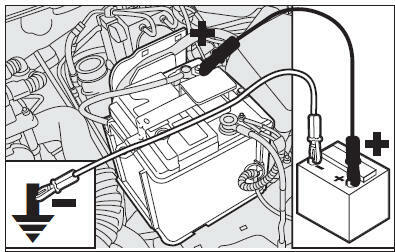 When the engine has been started, remove the leads reversing the order above. If after a few attempts the engine does not start, do not insist but contact the nearest Fiat Dealership. IMPORTANT Do not directly connect the negative terminals of the two batteries: any sparks may ignite the detonating gas which could come out of the battery. If the auxiliary battery is installed on another car, avoid metal parts touching accidentally between this car and the one with the flat battery. charger to start the engine as this could damage the electronic systems of your vehicle, particularly the ignition and fuel supply control units. must be carried out by qualified personnel because incorrect operations may cause electrical discharge of considerable intensity. The liquid contained in the battery is poisonous an corrosive. Avoid contact with the skin and eyes. Keep naked flames and lighted cigarettes away from the battery and do not cause sparks. Never bump start the engine (by pushing, towing or coasting downhill). This could cause fuel to flow into the catalytic converter and damage it beyond repair. IMPORTANT Remember that the servobrake and electrical power steering system are not operating until the engine is started, a greater effort will therefore be required to press the brake pedal or turn the steering wheel.